When a new slot machine comes out, players are always excited about the no deposit casino bonuses that surround it, and that's the case with RTG's Pirate Isle. 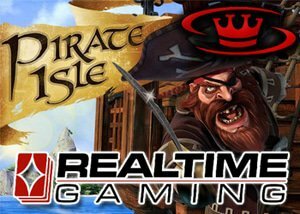 Realtime Gaming is set to release their newest title, Pirate Isle. This game features a pirate theme that has a bit of a deeper gameplay than most online slots out there today. They've been coming out with new titles to silence their critics over the past year, but this one is a bit different in that it's largely geared for longer sessions. Your adventure begins with a group of pirates headed to an island to go after some treasure. The main feature in this game that affects the gameplay the most is a key collection aspect. There's a ghost of a pirate chasing you down, and when he catches you, you're going to need as many keys as you can to satisfy him. These keys are collected during the course of your session, and that's why it leads to longer sessions for the most part. If you have all five, then you can cash in on some major wins with this ghost and your keys. Just in time for this new game is a great new set of casino bonuses for Slotocash. On your first deposit, you can get 100 percent up to $1,000 when using the SHERIFF100 promo code. Use SHERIFF150 on your second deposit for a whooping 150 percent worth as much as $1,000, and then turn up the volume on your third deposit with SHERIFF250 for 250 percent up to $1,000. After you cash in on all three deals, use SLOTO100COUNTY for another $100 added on without a fourth deposit required. The release of the new Pirate Isle game and the timing of the new welcome package at Slotocash couldn't have been better. It's the perfect time to get a ton of value while checking out Realtime Gaming's newest title and collecting some keys to cash in for some major wins. Overall, it looks to be a very in-depth game, and it's the kind of thing that online casinos could definitely use more of.